I have a confession to make: I don't think I've ever seen a single complete episode of The X-Files. Maybe one. It's always seemed like something I would really like, and I have close friends who were pretty much obsessed with it, and yet. . . When it originally aired, I think there was something else I watched that came on at the same time, I dunno, and then maybe after awhile, it just seemed like it'd be too hard to catch up on. In this age of Netflix and binge-watching, I've thought about starting it, but it's just always seemed like such an undertaking, you know? I've always intended to watch it, I just haven't. But this month, The X-Files: Cold Cases is a featured title on Audible, and I've been listening to it a bit to get a feel for it (which is maybe silly of me, since it takes place after the original series run, so... probably spoilers, yeah? ), and it's reminding me that I really should go and start a good ol' binge, because I probably really would love the show. And the audiobook. It's performed (narrated certainly is not the right description in this case) by Gillian Anderson and David Duchovny, of course, along with additional cast and sound effects -- the works. This makes it unlike other audiobooks I've listened to at this point, because though I have full cast recordings in my audio collection, I've not yet listened to anything that wasn't narrated by a single person doing multiple voices as needed. This is more akin to the old school radio dramas -- the OG audiobooks, if you will -- that captivated audiences in the early decades of the last century. It feels more immersive, more immediate, than audiobooks generally do (and they already feel a bit more immersive than a text book, since there's a voice and sounds in your ear). It makes for a pretty neat listening experience, and one that I'm sure will be a hit with the legions of X-Files fans. And hey, if it sounds like something that'd be up your alley, you can download it for free as part of a FREE 30 day Audible trial -- Or maybe you want a different X-Files book (they've got it) or any other of the many, many audiobooks Audible has to offer. Doesn't even have to be about aliens! They've got it all. You know what they say: the free audiobook is out there. . . 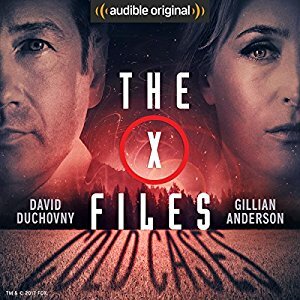 The series that had a generation looking to the sky gets a breathtaking audio reprise in an original full-cast dramatization featuring actors David Duchovny and Gillian Anderson returning to voice FBI agents Fox Mulder and Dana Scully. Based upon the graphic novels by Joe Harris - with creative direction from series creator Chris Carter - and adapted specifically for the audio format by aural auteur Dirk Maggs (The Hitchhiker's Guide to the Galaxy, Alien: Out of the Shadows), Cold Cases marks yet another thrilling addition to the pantheon of X-Files stories. Featuring a mind-blowing and otherworldly soundscape of liquefying aliens, hissing creatures, and humming spacecraft, listeners get to experience the duo's investigations like never before. Set after the events of The X-Files: I Want to Believe and providing additional backstory to the incidents that pulled Mulder and Scully out of reclusion prior to 2016's miniseries revival, a database breach at FBI headquarters allows an unknown group to access and capitalize on those investigations left unsolved - dubbed cold cases - by the secret department once known as The X-Files. As friends and foes of the agency long thought gone begin to inexplicably reappear, former agents Mulder and Scully come out of anonymity to face a growing conspiracy that involves not only their former department but the US government and forces not of this world. Here, fans are treated once again to Mulder and Scully's irreplicable chemistry as only the series' leads could deliver, Duchovny's deadpan and cynical aloofness finding its natural counterpoint in Anderson's unwavering intelligence and rigidity. Appearances from series regulars and the actors who made them fan favorites round out this must-listen arc: the gruff, no-BS righteousness of Walter Skinner (Mitch Pileggi); the distinctive click-puff of the Cigarette Smoking Man (William B. Davis); and the stooge-like hijinks of three beloved conspiracy theorists called the Lone Gunmen (Tom Braidwood, Dean Haglund, and Bruce Harwood). Whether you're a believer or a skeptic, find your "I Want to Believe" poster. Break out that makeshift alien stiletto. Grab a pack of Morley cigarettes. The truth is out there. You just have to listen. ©2016 The X-Files ™ & © 2016 Twentieth Century Fox Film Corporation. All Rights Reserved. (P)2017 Audible Originals, LLC. THE X-FILES THEME Written by MARK SNOW, Published by T C F MUSIC PUBLISHING, INC. (ASCAP), Courtesy of Twentieth Century Fox Film Corporation.